Sometimes you run into people who change your life for the best even while at their worst, regardless of what star you are circling. Those people are called Bartenders and Pro Se Productions proudly presents an out of this world universe spanning collection featuring stories of the men, women, and beings that man the taverns and pubs on every backwater world and upscale utopia in outer space and beyond. 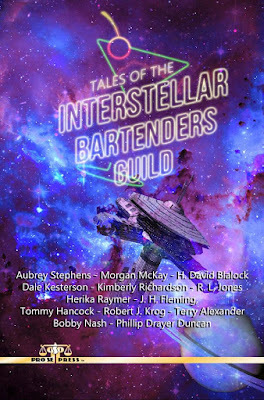 TALES OF THE INTERSTELLAR BARTENDERS GUILD is now available in print and digital formats. The Future. Humanity has spread through the galaxy, along with innumerable other races and creatures. In the thousands of solar systems that men have reached you’ll find monarchies, dictatorships, anarchies, utopia, dystopia, and utter chaos. But one slightly stumbling thread weaves through every world, every society– The Interstellar Bartenders Guild. As man took the leap out it seems that bartenders had something to do with it. These are stories of how they provided the shove for said leap. There are fistfights, love and lust, exotic bars, drunks, and a Guild Master with a mystery. Most of all you’ll find people- good, bad, lost, found, and somewhere in the middle. Mankind has grasped the stars but the problems that have been around since a thousand year ago are still with them a thousand years from now. Good thing they have the Bartenders of the Guild to help them solve their problems. Featuring a terrific cover by Antonino Lo Iacono and print formatting and logo design by Lo Iacono and Marzia Marina, TALES OF THE INTERSTELLAR BARTENDERS GUILD is available in print at https://www.amazon.com/Tales-Interstellar-Bartenders-Aubrey-Stephens/dp/1791568416/ref=sr_1_2?ie=UTF8&qid=1544810163&sr=8-2&keywords=Interstellar+bartenders and on Pro Se’s own store at www.prose-press.com/store for $17.99. This exciting adventure into mixed drinks and science fiction is also available as an eBook formatted by Antonino Lo Iacono and Marzia Marina for the Kindle at https://www.amazon.com/Tales-Interstellar-Bartenders-Aubrey-Stephens-ebook/dp/B07LBQFL9Z/ref=sr_1_1?ie=UTF8&qid=1544810190&sr=8-1&keywords=Interstellar+bartenderse for only $3.99. The book is also available to Kindle Unlimited members for free.